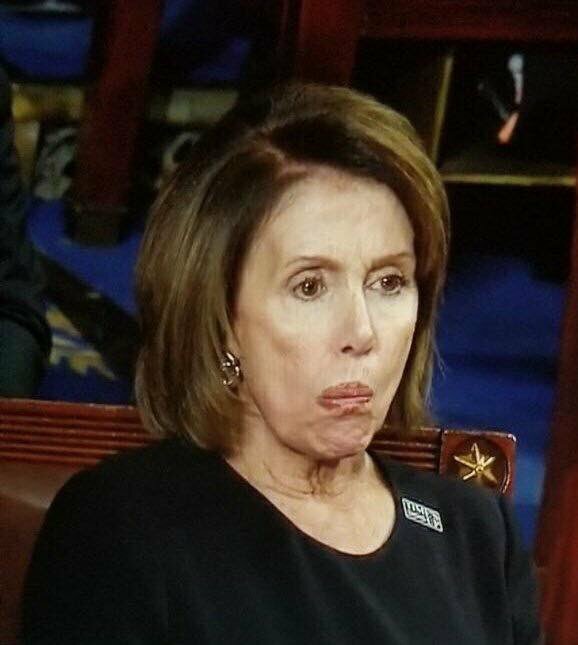 The face of Nancy Pelosi at the SOTU is the face of the effeminacy-pushing, white-toxic-masculine-man-be-damned, radical Democratic-Socialist Left, realizing their party is literally over. They needed and actually thought they could re-create the image of Western Man into their prescribed image…They re-fashioned our American House without the Father, and our society has suffered the horrible consequences on every level ever since. Trump is doing more than “teaching Republicans how to fight”, he is teaching men how to act like men again. God is restoring the Western Patriarch to power in the person of Donald J. Trump. You and I are witnessing the sequel to The Prodigal Son. We are witnessing the return of the Prodigal Father…to a very divided home. Faithful Americans are the original younger son, humbled in contrition having returned from the dead on one side, hated and despised by the older brother, void of “love and graciousness” and embodiment of the modern-day Pharisees on the other. You know who you are. God has returned the father figure through President Trump and restored the Patriarch to a nearly defeated Western Civilization…in the very nick of time. The Liberal-Democrats are foiled by their own projections. They campaigned against Friends’ Joey-The King of Queens-Seinfeld-Everybody Loves Raymond, and were destroyed by Braveheart, totally out-fought, out-flanked, and out-classed by the greater man…a REAL man! Nobody I talk to seems to consider the Tsunami Ripple’s reach from the FISA Memo Earthquake that struck Washington on February 2, 2018. Think of our world as the house the Prodigal Father returned to. The institutions my friend was concerned about are the rooms of the house. With the Father gone, the children literally turned the house upside down. The Church, previously located in the light-filled upper room, was locked away in the basement while the all-giving State was moved to the very top. The best rooms in the house went to the Hollywood Elites, the Oprah’s, Jay-Z’s & Beyonce’s, De Niro’s & Streep’s, Stewart’s & Colbert’s. The next best went to the CBS’s, NBC’s, MSNBC’s, ESPN’s and the CNN’s. Life became ONE BIG PARTY…until Dad came home. Before we move on, we have to ask ourselves how and why this happened. Who would want to remove, neutralize, and emasculate the essential and vital patriarchal force from Western Civilization…Nancy? Even Evolutionists understand that’s a bad move in a “survival of the fittest” world. Those of us who believe in God as the creator of heaven and earth understand He created man in His own image to have dominion over all the other creatures of the earth. God the Father in heaven created man to be the father on earth. As Gregory Koukl writes, “we bear the mark of God.” To remove us, is an attack on God and a denial of His dominion over us. Think about what is happening at the very cortex of our human society right now. A Memo has been released that reveals the most powerful men in the world to have considered themselves above the law. “Love of the Law and obedience to it is love of God and obedience to Him.” Ann Barnhardt: Must Read! Emasculation of the Father is the removal of honor, courage, integrity, and love in man…leaving the most crucial void. The Memo bread crumbs will lead straight to the character of the former President as the head of State who stepped in to fill the void they engineered and created. We can see for ourselves what has slipped into the Papal robes to become the anti-Father of the Church, giving aid and comfort to pedophiles while bowing to the Oppressor. This entry was posted in Economy, Entertainment, Politics, Religion, Society, Uncategorized and tagged barnhardt, dossier, Father, FISA Memo, God, investigation, mccabe, mueller, patriarch, pope, russia, schiff, SOTU, treason, trump. Bookmark the permalink. Our nation and our family relationships are in tatters because we are not running them within godly parameters. We are so broken. For a long time now we have done everything that we thought would work and like the prodigal son, it has left our families and our nation depleted. The prodigal son came to the realization of his stupidity and was sorry for it. Have you had enough of your own stupidity? Have you had enough of doing it your way? The creator’s plan is best! We have lost a lot, there is a lot to rebuild but if I read my Bible correctly, God is in the rebuilding businesss!